If you hold an empty Molson Canadian bottle up to your ear you can hear whispers of Doug MacLean talking about drafting Rick Nash. Doug may have good reason to brag, Rick Nash still owns the Blue Jackets franchise team records for goals, assists and points. So that one worked out pretty well for Columbus. How did they do the other years? 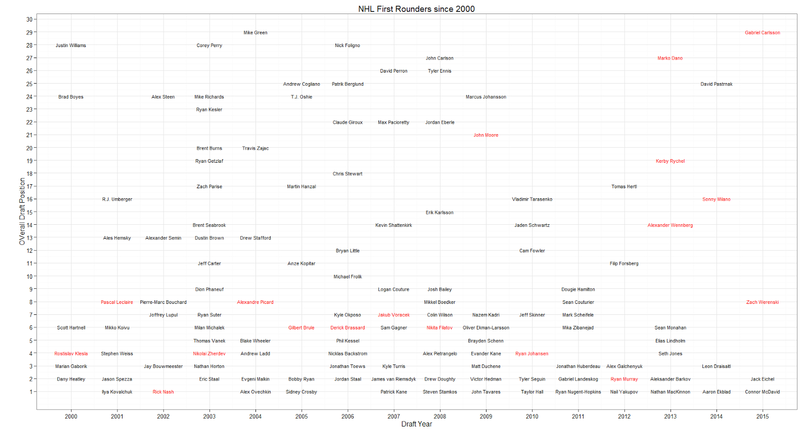 I've put together a couple of visuals to take a look back and see how the Blue Jackets 1st rounders did throughout their career and who may have been available but overlooked at the draft. 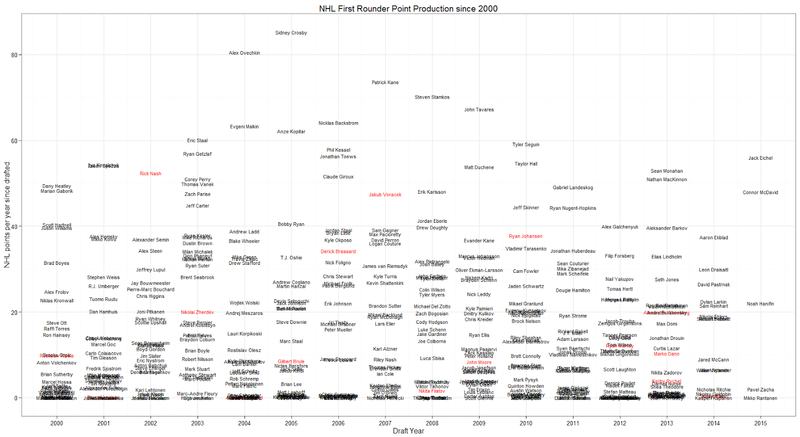 The first chart below shows each of the players drafted in the first round since 2000 and how many points per year they have earned. The "points per year" doesn't evaluate drafted goalies at all and it severely limits the value the true defensemen bring. I had considered using their All-Star status as a way to measure value but then we start to look at players like Nick Foligno (home team voting) and John Scott (gasp!). So for now, I am going with points as a way to evaluate how they have done. If we look at 2002 we see that Rick Nash is at the top of his class and by a decent margin. A goalie was drafted number 2 overall that year, but many of the other forwards don't seem to have come very close to what Rick has accomplished. Doug MacLean is a genius*! We can start to see players like Crosby and Ovechkin really stand out overall. As we move along to 2007, we see the 2016 Ted Lindsay, Art Ross and Hart Award winner Patrick Kane with a big lead. You may be surprised to see who has the second most points per year among first round draft picks in 2007. It is Jakub Voracek. Man, I wish the Jackets still had him! The next chart takes all of the first round draft picks since 2000 and filters it down to just the players that have averaged over 25 points per year. This time the chart shows the order in which they were drafted so all of us Blue Jackets fans can have some good referencing material for our complaining. The first 3 years, there's not too much to chirp about. The Blue Jackets were a new organization in 2000 and needed a defenseman, in 2001 they decided to lock up a "long-term" goalie with Pascal Leclaire and in 2002 they landed Rick Nash. Pretty good start. What could go wrong? In 2004, the NHL had a very deep draft class. With SO MANY talented players that year and the 4th overall draft pick, the Blue Jackets are sure to get a franchise player. Unfortunately the Jackets drafted Nikolai Zherdev and missed out on many All-Star players. In 2004, many would call Picard a bust, but there weren't that many drafted after him that had stellar careers in the NHL. In 2005 the Blue Jackets drafted Gilbert Brule over Anze Kopitar, yeah, that one still hurts. The next year Derck Brassard was drafted and despite it not working out in Columbus, he has been a solid player in the NHL. 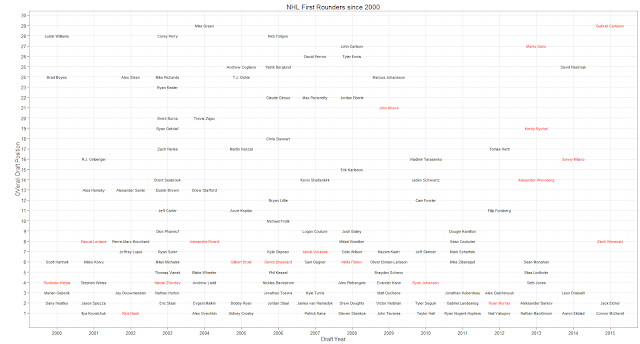 Claude Giroux is sitting there at 22, but at the time that would have been quite a stretch to draft him 6th overall. In 2007 Voracek turned out to be one of the best players behind Kane, so kudos to the scouting staff and Scott Howson for that one. The Blue Jackets could have really benefited by losing more in the 2007 - 2008 season. A higher draft position could have meant drafting Steven Stamkos, Drew Doughty, or Alex Petrangelo. At the 6 spot, the CBJ drafted Nikita Filatov. I lost one of my favorite hats to one of his hat tricks, and we didn't get much else from him. Colin Wilson and Mikkel Boedker may have been better choices, but those players wouldn't have turned the franchise around in short order. The Jackets made the playoffs in 2008 - 2009, so their 2009 draft spot was 21. John Moore seemed to be a good choice at that position. The next year the Jackets selected Ryan Johansen 4th overall and he developed into a terrific player. The Blue Jackets traded away their 2011 first round pick (Boone Jenner was an early 2nd round pick) and 2012 was the year they drafted Ryan Murray. The 2013, 2014 and 2015 drafts are a little too recent to draw that many insights from. After all of this, I have learned something. I have been holding in my mind a perception of the Blue Jackets inept 1st round drafting abilities. If I'm ever caught in a bar discussion over CBJ draft picks, I'm very quick to point out 2003 and how HUGE of a miss that year was. Overall, the Jackets haven't done too bad considering. Scouting talent and predicting future success is not easy and even after I look back over 15 years of drafts with a skeptical eye, they did all right. The recent draft picks are doing well over at the Lake Erie Monsters, so maybe there is hope after all. The Blue Jackets have the 3rd overall pick in the Draft tonight so tune in and see who gets selected. Hopefully in a few years we won't be talking about the players that the Jackets should have drafted in that spot.